Tasted at Bordeaux Index’s “10-Year On” tasting in London. Once again, there is a touch of brettanomyces on the nose of the Branaire Ducru, though not as much as the Talbot. It offers light cedar and undergrowth scents, wild mint and sage. 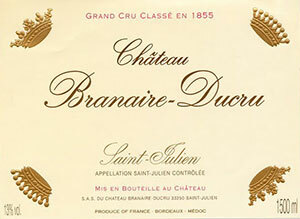 The palate is medium-bodied with fine tannins. It is comparatively (for the vintages) classic in style, quite conservative in many ways, but there is a sense of refinement on the finish that is unusual for the vintage. Fine. Tasted March 2013.